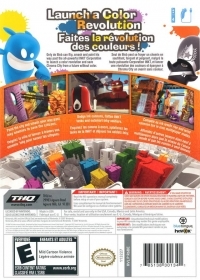 Description: Packaging text in English and French. Box Text: Launch a color revolution. Only de Blob can flip smash and paint his way past the all-powerful INKT Corporation to launch a color revolution and save Chroma City from a future without color. Paint the city and smash your way past Inky enemies to save the citizens. Dodge ink cannons, flatten INKT tanks and outsmart Inky soldiers. Compete as ink levels rise and wind cannons fire in nine multiplayer challenges. 02-06-2019 silverbow Box Text Launch a color revolution. Only de Blob can flip smash and paint his way past the all-powerful INKT Corporation to launch a color revolution and save Chroma City from a future without color. Paint the city and smash your way past Inky enemies to save the citizens. Dodge ink cannons, flatten INKT tanks and outsmart Inky soldiers. Compete as ink levels rise and wind cannons fire in nine multiplayer challenges. 10-09-2012 pacpix Box Text Launch a color revolution. 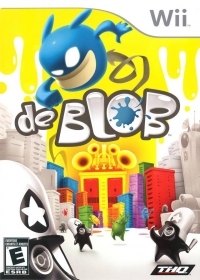 Only de Blob can flip smash and paint his way past the all-powerful INKT Corporation to launch a color revolution and save Chroma City from a future without color. Paint the city and smash your way past Inky enemies to save the citizens. Dodge ink cannons, flatten INKT tanks and outsmart Inky soldiers. Compete as ink levels rise and wind cannons fire in nine multiplayer challenges. 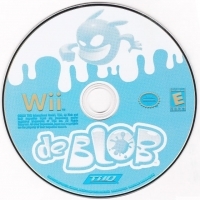 This is a list of VGCollect users who have de Blob [CA] in their Collection. This is a list of VGCollect users who have de Blob [CA] in their Sell List. This is a list of VGCollect users who have de Blob [CA] in their Wish List.